1. Preheat the oven to 200°C, gas mark 6. Place the flour in a large bowl then rub in the butter. Stir in the muesli, cheese and then the milk and bring together to make a soft dough. 2. Lightly dust the surface with a little flour then roll out the dough to a 2cm thickness. 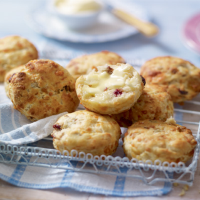 Using a 6cm plain cutter, firmly stamp out the rounds – try not to twist the cutter as this makes the scones rise unevenly. Reroll the trimmings and stamp out more. 3. Transfer to a non-stick baking sheet, brush lightly with milk and bake for 12–15 minutes until well risen and golden. Cool on a wire rack and serve just warm or at room temperature. Any leftover scones are delicious split, toasted and buttered the following day.